QUAD CITIES - Saturday's sunshine will give way to some Palm Sunday snow around the Quad-City area. A storm system is forecast to slide by to our southeast tonight and tomorrow. This will bring a cold rain to eastern & southeastern parts of the QCA late tonight. By early Sunday, temperatures will fall enough for a wintry mix and light snow to develop. This will change back over to rain by midday. Most snow accumulations will take place east of the Mississippi. 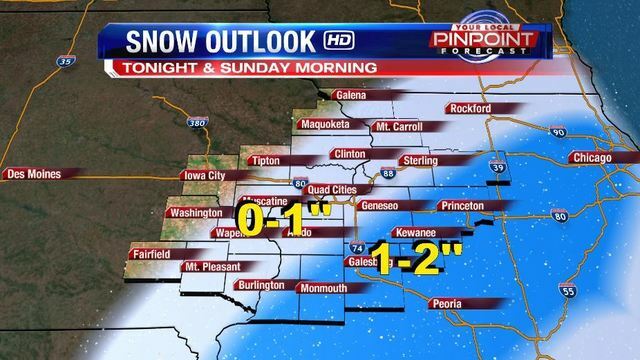 The Quad-City metro will likely see under 1". Slightly higher amounts (around 1-2", with locally higher totals) are possible farther southeast.